Edward "Moose" Cholak became a wrestling star at Chicago Vocational High School and went on starring for 40 years as he took part in 8,000 matches, in 1963 becoming world champion. 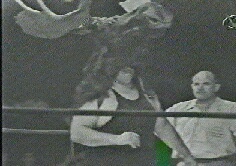 Variously called Moose, Golden Moose and Yukon Moose, he was a wrestling fixture across the Midwest and on television. The Calumet Beach Inn tavern he inherited from his father was a neighborhood fixture on the Southeast Side, where he was born. No, folks, he wasn't nicknamed Moose because he was born in Mooseville, Maine. There is no Mooseville in Maine, although there is a town named Caribou. His wife suspects wrestling promoters came up with that tale. One sure thing is that he always was a big moose of a guy. He stood 6 feet 2 inches and weighed 260 pounds when he was a tackle on coach Ivy Williamson's University of Wisconsin football teams in 1949 and 1950. A decade later he stood 6 feet 4 inches and weighed in at 360, telling sportswriters firmly, "Now this isn't fat, this is maturity." Mr. Cholak died early Thursday at St. Margaret's Hospital in Hammond, Ind., of pneumonia that developed after he suffered a stroke Oct. 22. He was 72. He grew up in a neighborhood full of people who, like his father, were of Croatian ancestry. He went to Chicago Vocational because he wanted to be an engineer. His college career was cut short by the Korean War, where he served as a Seabee--doing engineering--in the Navy. In 1952 he was All-Navy heavyweight champion in boxing and wrestling, the only time one man held both titles. In high school he was all-city wrestling champ, and he was an AAU amateur champion. He was in an amateur match while in the Navy when he was spotted by a Canadian-born Indian wrestler, Chief Don Eagle, who asked if he'd like to turn pro. As soon as Mr. Cholak got out of the Navy, Chief Don Eagle called him and his new career began. He wrestled in 8,000 matches between 1953 and 1987, an era when the sport evolved into television entertainment. In 1963 he won the International Wrestling Association championship in a match in Japan, defeating Rikidozan. He also worked for 20 years for the City of Chicago as an engineer, from 1976 to 1996, and whenever he wasn't wrestling at home or on the road, worked nights and weekends at the family bar until he sold it in 1980. That's where he met his wife of 45 years, Arlene. She and some of her high school friends had gone there for the Friday night fish fry, and he was just back from the Navy, helping his folks. They courted for five years and married in 1957. His last five years with the city he was on disability leave with a severe knee injury suffered when he fell over equipment on the job. Mr. Cholak was a wrestler with a college education and an inquiring mind. In the early 1960s he attended lectures on Zen Buddhism that Alan Watts delivered at the University of Chicago. Then he went to Lake Forest to hear novelist Aldous Huxley talk about visionary experience. He said Huxley had taken LSD and was hallucinating. Mr. Cholak went backstage and when Huxley learned he had heard Watts, made him sit down and they talked for an hour about Zen and Watts. Survivors in addition to his wife are a daughter, Kathleen Cholak, and a son, Steven. Visitation will be from 2 to 9 p.m. Sunday at the Elmwood Chapel, 11200 S. Ewing. Services will be at 10 a.m. Monday at Annunciata Church, 11128 Avenue G, with burial in St. Mary's Cemetery, Evergreen Park. As a chicago native south sider,i loved it. I sometimes used to see moose at the jewel food store on 106th. Thanks for the memories! While there may not be a Mooseville in Maine, there is a Moosehead, Maine and Moosehead, ME was the hometown he used as a wrestler. I was provided with the article by a librarian at the Rockford Public Library. I had a discussion about how my father used the name Moose cholak as an everyday expression when he saw a very large person. I grew up in the 50's and 60's and was very pleased with the article. It was well written and I enjoy it very much. I am also sharing it with my family. As a child growing up in the 60's wrestling what one of the best things on tv. They even brough some of it to town when I was a kid and we always cheered for Moose!! Bless him and all of his family on their journey and the blessings and joy that he brought to a farmer's son in iowa. In front of the tv with pop corn, apples and the Moose. He will be deeply missed. I used to wait on him at Dimiti&#39;s Restaurant in Whiting HIm and his wife and son.When he walked in everyone just stared and said you know who that is, That&#39;s the famous wrestler from Chicago, Moose Cholek.It was an honor to meet him. I used to wait on him and his family at Dimitri's rest in WHiting . It was a honor, People used to say you know who he is, He's the famous wrestlerfrom Chicago.He was a great person to all who new him. This is an excellent presentation of the story of his life. Growing up as a kid in New England, Moose was my favorite wrestler because I thought he was local. Too funny. He had great skills and it sounds like he was quite a man outside of wrestling. RIP to a good man. As a pro wrestler Moose may not have been &quot;The best of the best&quot;, but he for sure was one of the toughest. Fans always got their money&#39;s worth when he entered the ring. Many times in Indianapolis I witnessed him being escorted to the ring by local police and young kids who looked up to him as their hero. He knew that without the fans their wouldn&#39;t be pro wrestling. He sure knew how to work the crowd and get them on his side. That was in the late 60&#39;s/early 70&#39;s when wrestling was great, not what it has become today. R.I.P. champ. As a kid who grew up in the 50's and came of age in the 60's, my younger brother and I spent many memorable hours watching pro- wresting. We booed and hissed at the Gallagher Brothers, laughed at The Indian's, Killer Kowalski's, and Man Mountain Dean's absurd antics, but it was Yukon Eric and "The Golden Moose", or maybe just the familiar "Moose" Cholak, who really made the show for us. And today, in the autumn of 2013, the memories of the "The Golden Moose" throwing himself backwards into the ropes to gain momentum, then forward, leaving his feet, to fall on his next victim, followed by the muffled slap of the referee remain. I guess I'll call my brother in TX. RIP Moose and the other brothers. Moose was a generous person who worked with me at the YMCA. I'm writing this for my good friend Jim, He said he wrestled the mouse when he was a boy at 9 years old and Jim was 10 and Jim would beet him on 103rd and ave G east side Chicago, they would tear up the neighbors lawns. he has a lot of great stories from back then.